Charles Darwin inspired the journal strategy I am sharing. How did this evolve you ask? While reading CHARLES AND EMMA: THE DARWINS' LEAP OF FAITH by Deborah Hieligman, I learned that Darwin’s brain over connected and was over stimulated and often got quite cluttered. Enter Charles Darwin’s solution: alphabet journals—an A journal dedicated to things beginning with the letter A, and a B journal for things pertaining to the letter B and so on. Categorization. The brain loves categories, groups, and classification. For me, Charles Darwin’s idea evolved into keeping project journals. To the point my Zack Delacruz Journal is a Zack Delacruz bank. Since my debut middle-grade humor novel, ZACK DELACRUZ: ME AND MY BIG MOUTH, is the first in a series, I needed a project journal for all things Zack—a Zack Delacruz bank. 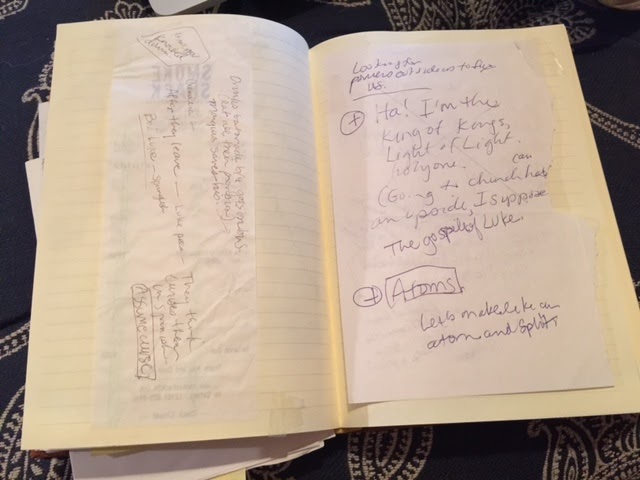 This project journal became a bank in which I deposited ideas—notes made on gum wrappers, Post-its, or any writable surface I could scrounge up in the wild of the world. To complete the deposit, I tape it into the project journal. I’ve already finished book two in the Zack Delacruz series (Look for it in the fall of 2016). Now, I am working on book three, collecting and making as many deposits as possible. Later, withdrawls from the ideas the bank will help me add humor and natural textures from real life, which is essential for realistic fiction. Lately, I’ve begun calling my Zack Delacruz project journal a Zank—short for Zack Bank. That’s right, Zank. While drafting this book, I took paper and pen to one of my favorite restaurants, Chris Madrid's, and took notes on everything because I used it as a setting for a scene in ZACK DELACRUZ: ME AND MY BIG MOUTH. Below, you can see illustrator Andrea Miller's interpretation of the scene. Stories need drama and character changes to be interesting. As a former sixth grade teacher, I deposited voices and situations into my project journal. 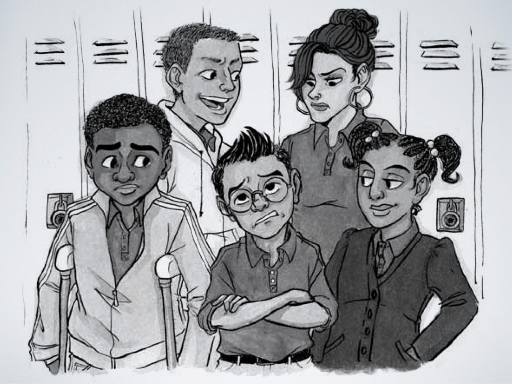 Andrea interpreted those voices and situations into illustrations like the one you see below. A book has a long journey, from project journal to many drafts, to final draft, to illustrator, designer and completed book. Is there a book you want to write? Maybe you find yourself writing about a particular topic all the time--a friendship or pet or interest? Or maybe you want to start writing about a topic. Do it. 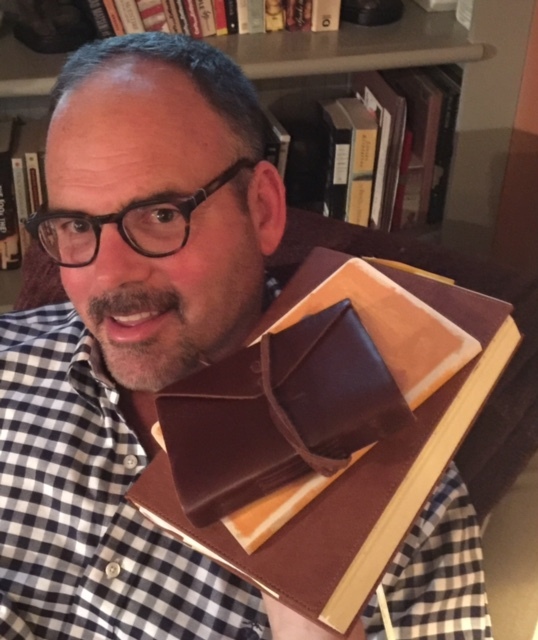 Make a project journal for anything that’s worth its own journal to you. Pick a journal that’s right for your subject: Is it short and compact or a long and winding road? Small, large, lined? It’s all yours to decide. When you go out into the big wide world of wonder, don’t forget to bring something to write with. It may ruin a few pairs of pants, jackets, or shirts, but the collection of ideas will be worth it. When you see something of interest you want to remember or that MIGHT be a deposit in your bank, scrounge for a writing surface, scratch down your thought or observation, and when you arrive at home, tape it your new bank. Make a funny name for it, like Zank, and it will be even more fun. Jeff, a full-time staff developer and writer, shares strategies from his books MECHANICALLY INCLINED, EVERYDAY EDITING, 10 THINGS EVERY WRITER NEEDS TO KNOW, and REVISION DECISIONS with teachers around the United States and beyond. 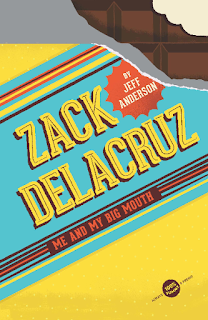 ZACK DELACRUZ: ME AND MY BIG MOUTH is his first humorous middle grade novel. Right now he enjoys talking to students about this new series. See a fun book trailer for ZACK DELACRUZ: ME AND MY BIG MOUTH by Georgia librarian, Kristen Deuchle HERE. 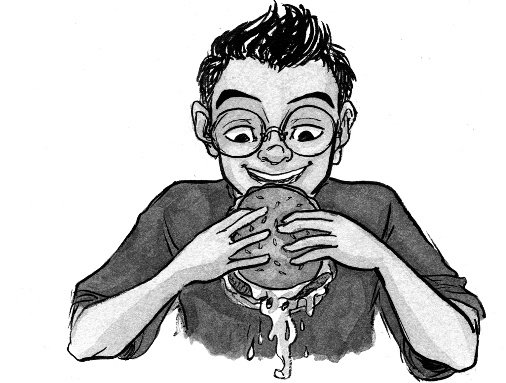 Buy a copy of ZACK DELACRUZ: ME AND MY BIG MOUTH at your local bookstore or go HERE for a link! Much gratitude to Sterling Publishing for offering a giveaway of Jeff's new book, ZACK DELACRUZ: ME AND MY BIG MOUTH to a commenter on this post. Please leave your comment by Sunday, November 1 to be entered into this drawing. I've never written a book, yet, but as a teacher, have kept various notebooks with different identities, poetry, sketching, different things I want to remember about my students, writing with my students. Love hearing about your 'project books', & that you taped your ideas grabbed into them when you could, where they should be placed. Congratulations on this new book, have heard others write good things about it. Thanks for sharing a great idea! I get to come listen to Jeff's amazing ideas and meet him in person this week! I can't wait to hear more. I tease my students that I'm stalking him because he has such great ideas for making writing fun. Hope to hear more about Zack! I love that Jeff doesn't tidy up his ideas by typing them onto his computer. What a great idea. It even has a kid-friendly feel. I plan to share this post on Facebook and maybe my personal blog too. Best of luck to you, Jeff Anderson. Your series sounds awesome. Great idea. In my book, "Teaching the Story: Fiction Writing in Grades 4-8" I talk about making an information bank when you're brainstorming a character or setting. You took the idea one step further. Best wishes on your debut novel! I like the alphabet idea. I have so many idea journals, when I want one part icular idea I know is somewhere, I have to sort through the stack. 2016=alphabetical idea journals. Thanks! Very clever and intriguing how you accept any of your ideas into your project book! Fun, fun, fun! I promise I didn't pay her to say that. I am pleased to see that I see four of my followers' comments here. Yay! Chris Madrid's is my favorite hamburger joint ever!!! 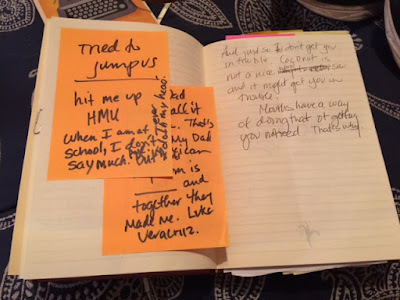 Okay, the idea of project journals is pretty cool too. I love this idea of project journals...I keep saying I need to get writing more...maybe this idea will help get me motivated! old rehashed material. Great read! I've bookmarked your site and I'm adding your RSS feeds to my Google account.